We've been staying pretty busy with summer activities. It's hot. Summer camp is in full swing and after a rocky start, I'm happy to say both girls are now having a great time. Valerie is even asking if she can do it again next summer! I'm glad the girls enjoy it because there is only so much Mommy can give them. Both crave interaction with other kids and like being out of the house. We do skip out on camp 1-2 days a week to go on play dates, visit my Dad, or just to stay home and swim. Val has turned into quite a fish all of a sudden. As Clint put it, her 'down the bayou' is coming out. She was traumatized by horrid swimming lessons three years ago, and is just now getting over her fear. 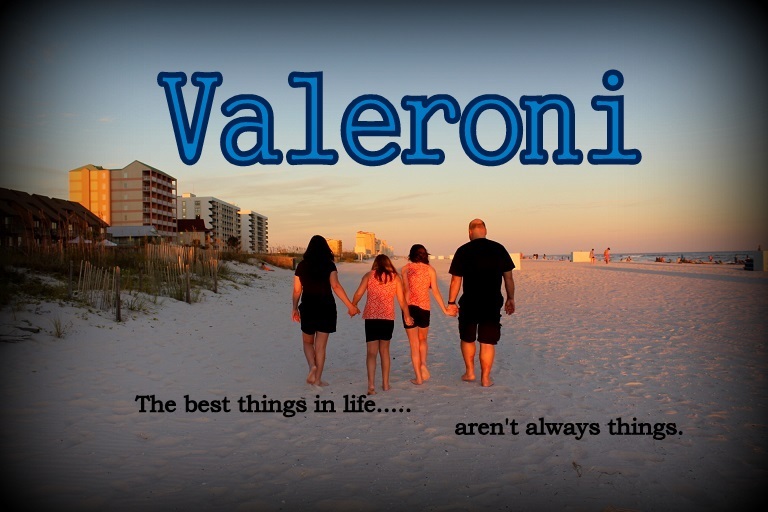 Veronica is following her big sister and both have decided they can and like to swim underwater. I'm amazed. This week we'll be gearing up for our annual 4th of July party!! Invitations went out a few weeks ago. Most of the party supplies have been bought. I just have a few last minute things to pick up. And I'll be getting the house and yard a bit more presentable this week. I don't like that I have had some 'fishing' for an invitation. After being excluded for over a year, I'm suddenly told I'm always welcome, no invitation needed. I know better. Just a coincidence? Perhaps, but most likely not. There's more to this story, but.... If inviting us may clash with other guests, we can't risk having the same happen here. Sometimes, I just get tired of being nice. Happy Father's Day to all the Dads!! Valerie came up with the idea for this pose by herself! I spent a lot of time at the skating rink in my younger days. It seems we went almost every weekend as a teen. One of my friends' parents would drive us, and my Dad would pick us up about 11:30 - midnight, unless we were staying for a lock-in. We always went with the hope of meeting a cute boy. Sometimes we did, but usually we didn't. Fun times and great memories!! A few weeks ago we attended a birthday party at the local rink. I decided to brave it and put on roller skates for the first time in about 25 years!! It took me a while, but it all came back. I was roller skating and I still loved it. Val and Roni put on wheels for the first time in their lives, and did surprisingly well. They loved it so much we went back the very next day. We've gone several times and the girls have gotten comfortable on the rink. I was overjoyed the girls liked it because this is something I can do too. Something for them, and for me too! Plus, it's great exercise for me as well. I was even considering buying my own pair of skates. Until yesterday.... now I am having second thoughts. Yesterday, we went for our weekly Tuesday skating session. I usually skate slowly towards the outside when there are lots of people on the rink. Too many dangerous obstacles like little kids falling and cutting right in front of you. Most of them never look - they just dart out onto the skating floor. If it clears out a bit, then I speed up, mostly to burn a few more calories, and to see just how fast I can comfortably go. Well, yesterday as the floor emptied, I sped up. I went faster. A little faster. Right skate, left skate, Ri---. My right wheels caught on something on the floor. I don't know what it was - trash or something somebody dropped. I just heard my wheels skid. Then I felt it... slam, I hit the very hard floor, very hard. It took me a few minutes as all the skaters zoomed by like nothing happened, but I managed to gain my composure since I had to get up and out of the way. Boy, did I hurt. All over. I guess I am lucky I didn't break anything. After ice packs, a soak in the tub, and numerous pain pills, I'm still felling it today. It hurts to walk, stand, sit, bend over... Will I put on skates again? Probably. Just no more 'speed skating' for this old lady. Summer is definitely here with temps close to 100 degrees already!! Earlier in the week Val and I took a bike ride to the back of our subdivision, so I could show her the big pond that was dug back there. It isn't very far but it was so hot!! Her little face was so red from the heat. It didn't help that her training wheels broke so we had to walk our bikes back. I felt so bad for bringing her back there. I guess I will stick to bike riding with no kids! We've enjoyed a break from the routine with trips to the skating rink, spray park, and library. And swimming in our pool. It's been busy and we're about to get busier. Both Val and Roni are attending summer camps. Veronica started Wednesday and Valerie starts on Monday. They haven't had a summer home in a few years.... in fact, I don't think they know that most kids are off during the summer (shhh!) Veronica for one is much happier when she goes to school. Valerie is already bored so I can't imagine how a whole summer with nothing to do would be! They both crave much more interaction than I can give them. I'm sure other playdates will pop up here and there, and the good thing is they can skip camp if we want to do something else. Veronica's theme for the week was The Old West, so today was a dress up day. Yee Haw!